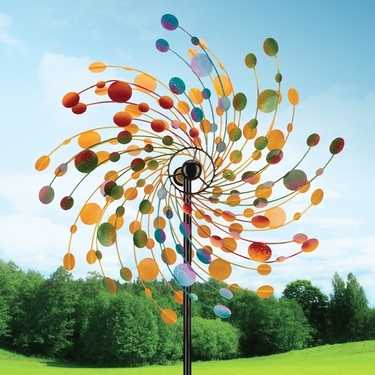 Add colorful celebration and pizazz to your landscape with this 32” Confetti Wind Spinner! Not only does this spinner twirl with the wind in opposite directions to create a mesmerizing effect, it also has an added feature of rotating on the top of the stake to help the blades face into the wind! We love extra-large wind spinners and we are thrilled to offer this new colorful impact design that actually spins! Powder coated to resist the elements.